Tired of nosy roommates, bosses, coworkers and curious passers-by gawping at your laptop screen as they walk by? 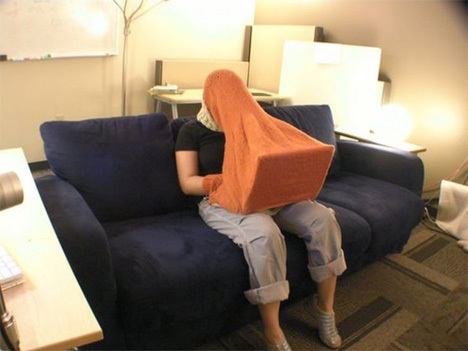 Why not wrap yourself (and your laptop) up in a weird giant tube sock for some privacy? Instructables user Bekathwia invented the hilarious knitted Laptop Compubody Sock for just this purpose. It’s a fabric tube that covers your head while letting you see the your laptop screen. 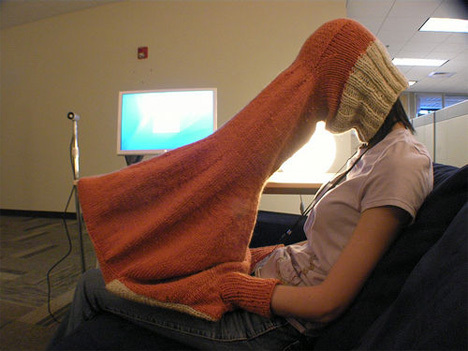 There are even hand-holes so that you can continue to type comfortably while sucking up all of the privacy in the room. 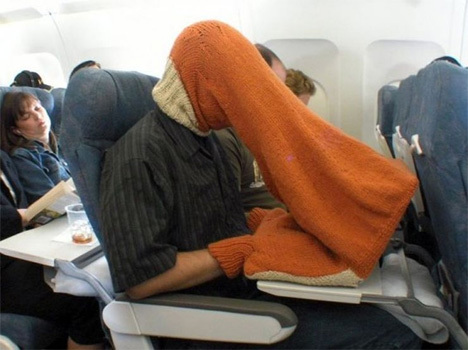 Will the Laptop Compubody Sock get people to leave you alone while you’re surfing/working? Probably, but only because they’ll assume you’re a little off kilter thanks to the sweater tube protecting you and your computer from any human interaction. See more in Various Gizmos or under Gadgets. February, 2013.